Florianopolis is the capital of the Brazilian state of Santa Catarina. The city is split between the country's mainland and Santa Catarina Island. The area has some of the country's best beaches and it has grown into a popular tourist destination. The northern beach resorts of Jurere, Daniela, Canasvieiras, Brava and Ingleses have a lot of hotels and tourist amenities. They can get quite crowded during the summer months. The eastern beaches of Joaquina, Mole and Mocambique are great for surfing and appeal to young travelers. To the south include Campeche, Armacao and Morro das Pedras. They are also good for surfing. Lagoa da Conceicao is a large attraction on the island and is a popular place to visit. If you're traveling alone, there is no shortage of hostels that offer a social atmosphere. Many hostels host parties or group dinners that encourage guests to interact and get to know each other. 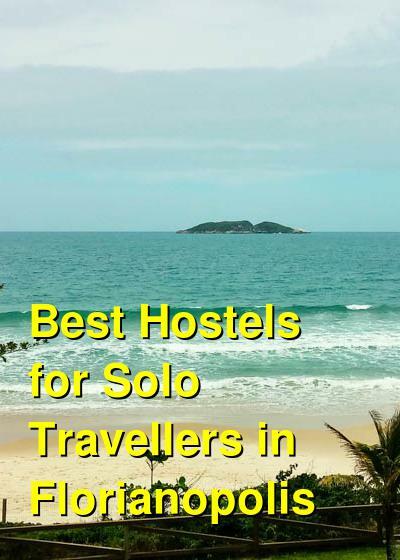 How much do hostels in Florianopolis cost? If you're traveling alone and looking for a social hostel then Barrab Beach Club Oceanfront Hostel is a great option. They offer all kinds of activities for guests including surfing, sand boarding, stand up paddle boarding, windsurfing, paragliding, and boat parties. It's the place to come if you're looking for a party as they give guests discounts to local clubs and more. The hostel is located right on the water and you'll have access to a semi-private beach that is just a short walk away. There's a restaurant and bar on the grounds that serves dinners and drinks. There's also an all-you-can-eat breakfast buffet and a free drink for guests every night. Other amenities including laundry facilities, internet access, and large televisions. There is plenty of community space available including a barbecue area, hammocks, oceanfront gardens, the restaurant, and a social bar area. The hostel regularly hosts a variety of events and activities. They also offer discounts to different activities in the area. If you're traveling alone and are looking for a social setting, then this is the place to stay. Geckos Hostel is conveniently located in the heart of Lagoa da Conceicao. This is a nice lagoon in the tourist center of the city. It's very close to many different beaches, sand dunes, activities, and food options. The hostel has an eco friendly philosophy. It is powered by solar panels and the furniture is made from recycled wood. If you're traveling alone, this is a great place to meet other guests and make some new friends. There is a large common area that has a satellite television and dvd player, a computer, books, and comfortable sofas. There's also a patio, balcony and garden area where you can enjoy the pool. Many guests enjoy hanging out in the hostel's bar and there's also a barbecue area if you want to prepare some food. There are also countless hammocks throughout where you can relax after a busy day on the beach. There are both private rooms and dorms that you can choose from. Twin and double private rooms are available. Dorms sleep either four, six, or eight people and both female only and mixed rooms are available. Tucano House Backpackers is a favorite, award winning hostel in Florianopolis. The hostel is owned and run by a group of international and local travelers who work hard to make sure you have a good time during your stay here. They love the island, and want to make sure you love it too. The hostel is located in the middle of a suburb along the banks of Lagoa da Coneicao. It's surrounded by some of the best night clubs and bars in the area. If you're looking for a party, then this is the place to come. It's also about a ten minute drive from some of the best beaches in the area. The hostel has large rooms that offer a lot of natural light. There are both private rooms and dorms available. Dorms range in size and sleep six, ten, or twelve guests. Both female only and mixed dorms are available. Backpackers Share House is an established hostel in Florianopolis. It's located on the beach by Barra da Lagoa, which is a fishing village that is surrounded by a natural setting. There are restaurants, grocery stores, and public transportation all close by. 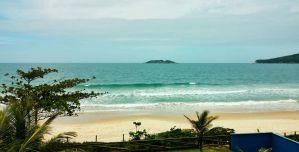 It's a short bus ride to popular beaches like Mocambique, Mole, and Joaquina, and is also a short trip to Lagoa da Conceicao, and its active nightlife. The hostel is a fun and relaxed place to stay. They have beautiful outdoor terraces that look out over the beach. It's a great setting to relax in a hammock with a good book. There is also a bar and an eating area where you can easily meet other guests. There are plenty of nearby activities including kayaking and surfing. The hostel organizes all kinds of events for guests and there are regular parties. You can also take surfing classes, go paragliding, or enjoy any other beach activities. If you're looking for a social atmosphere with a lot of fun things to do, then this is a great place to stay.